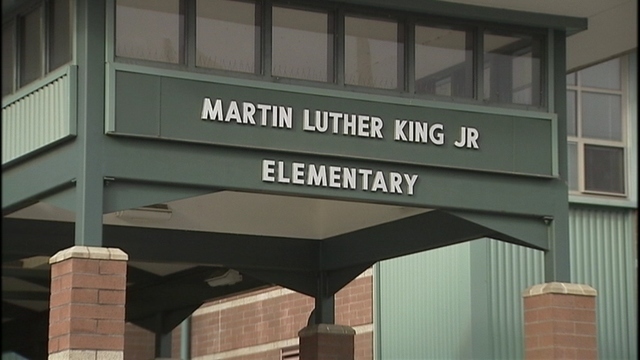 GHB Window Cleaning Inc. and Slick Watts, former NBA Seattle Super Sonic, team up to donate money towards new playground equipment at MLK Elementary School in Seattle. KIRO 7 viewers are stepping up after our story about a South Seattle school in need of sports equipment. Supersonics legend and current P.E. teacher, Donald “Slick” Watts, has gotten dozens of calls after telling KIRO 7 of a $500 donation from his friend at GHB Window Cleaning. On Monday morning, George Brewer presented the $500 check at an assembly at Martin Luther King, Jr. Elementary School. Watts says it’s all about making sure kids get physical activity. The donation isn’t lost on the students. Watts is encouraged by the offers for more donations and hopes more businesses will step up. Watts says this all just reaffirms what he’s known since he moved here 40 years ago to play for the Sonics. “Seattle, Washington is the best place in the world to live,” said Watts. With Monday’s donation, the school is also getting 20 4-square balls, 10 basketballs, and about 30 jump ropes.